The album of World War One photographs mentioned in our previous post includes this shot of the town from a pilot-training aircraft over the Bay of Quinte, looking north over Deseronto. 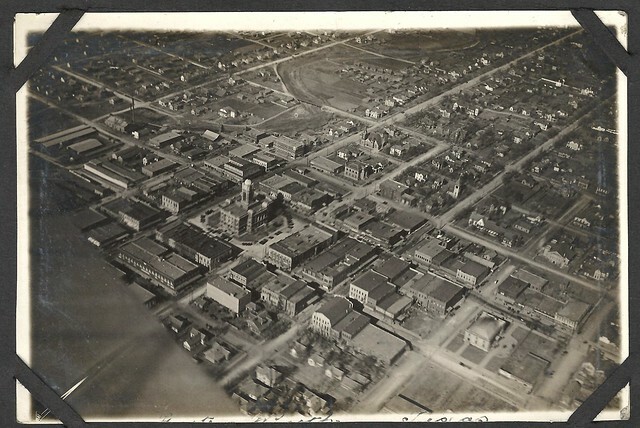 At the top left of the photograph is Rathbun Park and the Town Hall (at that time it was the Bank of Montreal), with Centre Street and the Post Office also visible. Between the waterfront and Main Street several railway cars can be seen, running along tracks where Water Street is today. The buildings next to the lake shore are the Rathbun Company’s cedar mill (on the right), which manufactured cedar railway ties, fence posts and shingles and the car works (on the left). The smoke from the cedar mill’s chimney shows that this was still in operation when the photograph was taken, although generally the Rathbun Company’s industries were winding down at this time, with many of their buildings being taken over for use by the Royal Flying Corps as administrative headquarters and repair shops for aircraft engines. 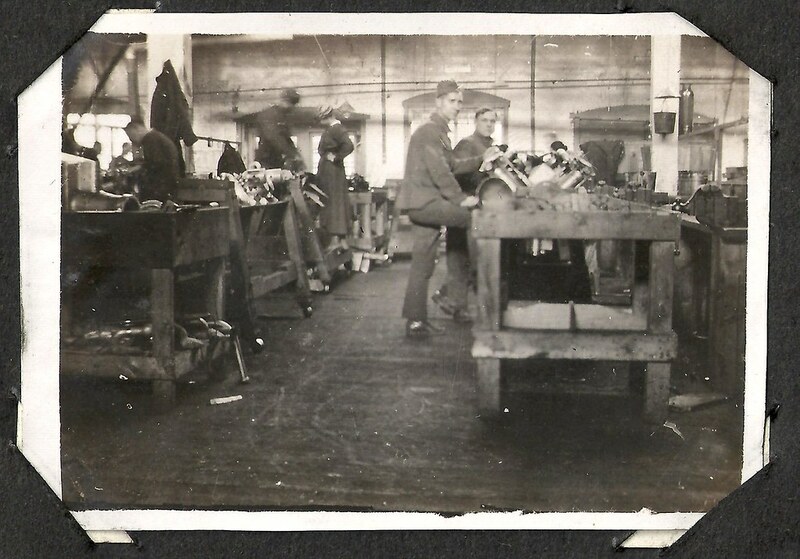 The picture below, from the same album, shows the interior of a typical engine workshop. Women as well as men were employed in mechanical work in these establishments (and, unusually for the time, at the same rates of pay). The person to the left of centre of this shot is a woman. *For a timeline demonstrating the increasing significance of aerial photography on the Western Front in the First World War, see this useful blog post by Tim Slater.